Amsterdam, NL – Since 1993, when the gene that causes Huntington's disease (HD) was identified, there has been intense focus on understanding how this genetic mutation causes the disease's severe progressive neural deterioration. In a new study published in the Journal of Huntington's Disease, investigators have discovered that the HD mutation may alter the interactions of Huntingtin, the large protein produced by the HD gene, with Rac1, a protein that directs changes in cell shape. In HD, this interaction may result in abnormalities in the pathway controlling neural cell shape and dendritic growth, which can affect how well nerve cells communicate with one another. “We are excited about this finding because it describes a functional change that occurs very early in HD models, including in human neurons, and might underlie the earliest changes experienced by HD patients. Rac1 is currently a major target of investigation in the cancer field and in Crohn’s disease, so compounds that can modify its function are already being heavily investigated. Thus, we can exploit the knowledge obtained by other clinicians and researchers to help us identify potential early interventions for HD,” explained Kimberly Kegel-Gleason, PhD, Laboratory of Cellular Neurobiology, Department of Neurology, Massachusetts General Hospital, Charlestown, MA, USA. The ability of a cell to change shape is important for the capacity of cells to move (migrate) and for neurons to connect and communicate with each other. Rac1 directs changes in cell shape by modifying actin dynamics in response to extracellular signals (growth factors) downstream of an important cellular enzyme called PI 3-kinase. Actin is a protein that contributes to the contractile ability of muscle and other cells. The aim of this study was to determine whether RAC1 activity is impaired in HD or regulated by normal Huntingtin, which could explain some of the pathological changes seen in HD neurons. Researchers discovered early changes in the activity level of Rac1 in human HD neural cells and mouse HD striatum. They showed that Huntingtin (both normal and mutant) and PI-3 kinase, preferentially associate with the active form of Rac1. Normal and HD neuronal cultures responded very differently to lowering total Huntingtin protein. Cells responded to lowered total Huntingtin by increasing Rac1 activation. However, lowering total Huntingtin levels (both normal and mutant) in HD neuronal cultures seemed to counteract an abnormal increase in Rac1 activation. “These data suggest that ongoing trials using Huntingtin-lowering reagents may be beneficial to HD patients, but the same treatment might be quite toxic to normal individuals,” commented Dr. Kegel-Gleason. 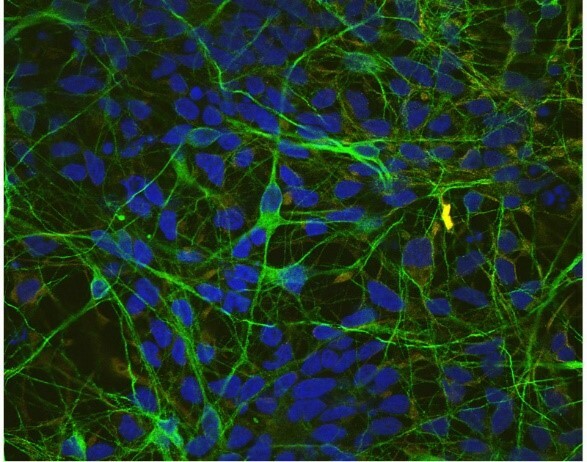 Image shows human HD neurons in green in a culture differentiated from patient HD iPSCs (induced pluripotent cells). Increased levels of Rac1 activity were measured in HD neuronal cultures compared to normal cultures and in young HD mouse striatum. HDiPSCs were differentiated towards a medium spiny neuronal cell fate. Neurons were identified by immunostaining for the neuronal marker Beta III Tubulin (green) and more immature cells with the Neural Stem Cell marker Nestin (red). Nuclei were identified using Hoechst stain. The image is a merged composite of three sequential confocal micrographs. Yellow shows rare co-localization (co-expression) of both Beta III Tubulin and Nestin in a cell structure. This research also identified a functional change that impacts a pathway controlling cell shape, including the shape of connections called dendrites. Dendrites are like fingers radiating from neurons that receive information from other neurons. The shape of those “fingers” can influence the strength of connections between neurons and hence the entire connectivity of the neuronal network. The investigators suggest that excess RAC1 activation may be the molecular mechanism underlying changes in the shape of dendrites emanating from HD neurons. This may be very important for understanding the early changes observed in HD prior to motor symptoms. Abnormalities in dendrite growth and spine density of medium spiny neurons have been found in brains of HD patients. These changes in structure may impair the ability of neurons to function and interact properly in HD. Full open access study: “Rac1 Activity is Modulated by Huntingtin and Dysregulated in Models of Huntington’s Disease” by Adelaide Tousley, Maria Iuliano, Elizabeth Weisman, Ellen Sapp, Ningzhe Zhang, Petr Vodicka, Jonathan Alexander, Hubert Aviolat, Leah Gatune, Patrick Reeves, Xueyi Li, Anastasia Khvorova, Lisa M. Ellerby, Neil Aronin, Marian DiFiglia, and Kimberly B. Kegel-Gleason (DOI: 10.3233/JHD-180311), appearing in the Journal of Huntington’s Disease, Volume 8, Issue 1, published by IOS Press. This article is openly available at: content.iospress.com/articles/journal-of-huntingtons-disease/jhd180311. This study was supported by a contract from CHDI, Inc. and by the Dake Family Fund. Contact Diana Murray, IOS Press (+1 718-640-5678 or d.murray@iospress.com) for additional information. Journalists who wish to interview the authors should contact Terri Ogan Janos (+1 617-726-0954 or tjanos@partners.org).